My experiences through real food and non-schooling family. Decadent Chocolate Cake (flourless, resembling the best brownies of your life). I wish I could remember where I found the original idea for this cake. I would like to credit them as it is absolutely brilliant. I stared at the ingredients wondering how a cake without flour would hold together. I was sceptical, but gave it a try and was amazed by the results. Without flour you get pure, delicious chocolaty-ness. I now make this cake for all birthdays requiring chocolate cake. I top it with the birthday persons favourite fruit and whipped cream and/or icing. It’s incredibly rich and special. I will give a few ingredient options, highlighting in bold the ones I used. Blend all ingredients together until smooooooth. Pour into greased pan lined with parchment paper. I use a large round clay pan, but an 8×8 or a bit larger would work too. 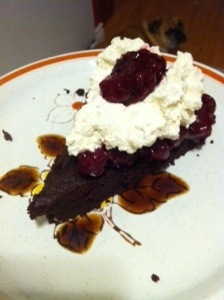 This can feed up to 20 people especially when cut into small pieces and generously topped with fruit and whipped cream. 2 cups frozen fruit, thawed. 1/2 cup sweetener, like honey. 4 tbsp thickener like arrowroot or potato starch. Mix all ingredients together while cold. Bring to boil and keep on until mixture turns clear (cooking the starch out). Dealing With The Overwhelming Messes of Parenthood. How to cut up your own organic free ranged dead chicken. I can’t afford organic food! Dental health, the other information. kitchen tips, body and earth friendly! Recipes of desire, nourishing sweet stuff.